United States Military pilots are selected and trained to be some of the best pilots in the world. Each of the services has different age requirements to become a pilot or navigator. Becoming a military pilot is a highly competitive process and requires a candidate to be at the top of his/her game both physically and mentally. Achieving high standards on any entrance exam tests such as the Aviation Selection Test Battery, Physical Fitness Tests (PFT), as well as Officer Aptitude Rating, and even the ASVAB. To become a Naval or Marine Corps Aviator, you must be between the ages of 19 and 26 at the time you enter flight training. Adjustments (waivers) can be made up to 24 months for those with prior service, and up to 48 months for those already in the military at the time of application. To become a Naval/USMC aviator, you will have to pass the Aviation Selection Test Battery (ASTB). It consists of five timed subsets: mathematics and verbal, mechanical comprehension, aviation and nautical, spatial perception, and a survey gauging interest in aviation. About 10,000 candidates sit for the exam each year. The Aviation Selection Test Battery (ASTB) is used by the U.S. Navy, Marine Corps, and Coast Guard to select candidates for pilot and flight officer training programs. Must meet a selection board before age 28 1/2. Must enter Undergraduate Flying Training (UPT) before age 30. Age waivers up to the age of 35 are considered. 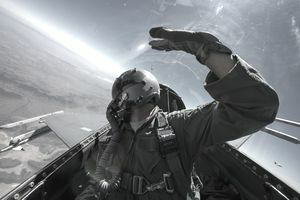 To qualify as an air force pilot, you will need at least a bachelor’s degree, earned at either a civilian college or university or the Air Force Academy, located outside Colorado Springs, CO. The Air Force uses the Air Force Officer Qualifying Aptitude Test (AFOQT). Similar to the ASVAB, this Air Force Test consists of 12 sub-tests to include: Verbal analogies, math, science, reading, table reading, and of course aviation information. The Air Force prefers science, math, and engineering degrees, such as aerospace engineering, physics, computer science, and chemistry. You will also need to have a high college grade point average, generally 3.4 or above, to be competitive. Candidates with civilian flight training, such as a private pilot's license, also tend to fare better with the selection board than those with no flying experience. Must not have reached the 33rd birthday as of the date of the convening board. Waivers for those who are 33 or 34 years of age at the time of the board may be considered, provided the applicant is otherwise exceptionally highly qualified. (Note: this means the applicant has a bachelor's degree, a high college GPA, flight training, or very high scores on the Army Flight Aptitude Exam. However, you can also join the Aviation Community of the Army right out of high school if you qualify for the Army Warrant Officer Flight Training Program. The Warrant Officer Pilot program allows for young men and women without college degrees to become pilots. If you don’t have a bachelor’s degree, the Army will test you using the ASVAB, college entrance exams like the SAT, or ACT to assess your qualifications for Officer Candidate School (OCS). The Army does have several fixed-wing aircraft in its inventory, but these are limited to seasoned and experienced aviators. Secondly, the Army is unique because Warrant Officer Flight Training (WOFT) contains a program casually called “street-to-seat” or “high-school-to-flight-school.” If selected, you sign a contract. If not selected, you have no obligation to the Army and are still a civilian. The WOFT Application Process works to eliminate those without the motivation to follow through as it is more difficult than it appears. The Coast Guard does not accept pilot applications unless the person has already been a military pilot in a different service. The Coast Guard currently uses the ASTB score to select pilot candidates for training on Coast Guard planes and helicopters. To apply, one must be over 21 and under 32 years of age, must have at least 500 hours as a rated military pilot, and must have full-time flying experience within two years of the application. To join the Coast Guard as an officer, you must qualify on portions of the ASVAB and the SAT and ACT college entry tests.